Boston City Council president Michelle Wu. Boston City Council President Michelle Wu said supporting families struggling with the rising cost of living is a priority, at a community talk at the Capital One 360 Cafe on Boylston Street Monday night. “It’s not right that today, people who are working two and three jobs can’t make ends meet,” Wu told a group of about 60 people at the cozy Back Bay cafe to hear the conversation led by Globe City Hall reporter Meghan E. Irons. The event, sponsored by The Boston Globe, comes after Wu’s inauguration Jan. 4, when she was sworn in as the first woman of color and the third woman in history to be elected as council president. The Roslindale resident, a two-term councilor, offered a look at her ideas as City Council president, including working with Mayor Martin J. Walsh to push forward initiatives. 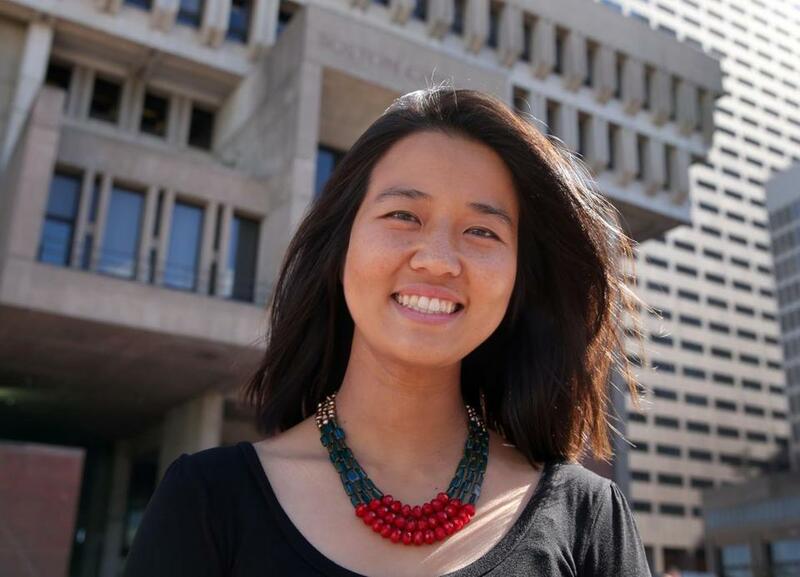 Wu, 31, was elected to City Council in 2013 and was reelected last year. She talked about last term’s achievement of passing the first paid parental leave policy in Boston. “It put Boston on the forefront nationally of this conversation of how do we truly support working parents,” she said. And for Wu, there’s no time to waste in doing more. A City Council hearing this week sponsored by City Councilor Ayanna Pressley will address income inequality, and raising the minimum wage is a topic on the table. “We need to have a real conversation about increasing the means by which people can pay for things, [and] increasing our revenues that come to families through a higher minimum wage,” Wu said. The one-hour conversation touched on a number of other topics, including reforming the criminal justice system, housing, and education. Wu answered questions about the homeless, the arts, and the mood of City Hall. “What I appreciate about the mayor is that his emphasis has not always been on agreement, but on communication. And that’s where I fall as well,” she said. Wu grew up in Chicago, a daughter of Taiwanese immigrants. She spoke candidly about her background, saying that politics was never part of the conversation at home. “Politics represented all sorts of not-nice things,” she said, for her parents and especially her grandparents, who fled from mainland China to Taiwan during the Communist Revolution. Ten years ago at Harvard College, from which Wu graduated with a economics degree, she was never involved in politics and didn’t know much about them. Wu later got her law degree from Harvard. “I still feel like a big newbie at this, and I’m going to take it a day at a time,” she said. South End resident Susan Collings, executive director of Art Connection in Boston, has been following Wu from the start. “I think she’s incredibly brave, and I’m touched by her story,” Collings said. Meghan E. Irons of the Globe staff contributed to this report. Alexandra Koktsidis can be reached at alexandra.koktsidis@globe.com. Follow her on Twitter@akoktsidis.